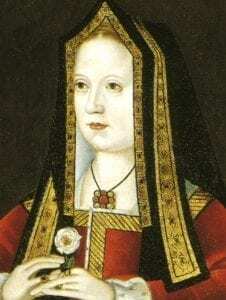 Elizabeth of York was the daughter of King Edward IV. She married Henry Tudor after he defeated Richard III at Bosworth Field and became King. Their marriage ended the War of the Roses. She had four children that survived to adulthood: Arthur Prince of Wales, Henry VIII; Margaret Queen of Scotland and Mary Queen of France. Elizabeth of York was born on 11th February 1466 at the Palace of Westminster. She was the eldest child of Edward IV, who had taken the throne from Henry VI in 1461, and Elizabeth Woodville. The Yorkists supported her father while the Lancastrians supported Henry VI. They had been fighting the Wars of the Roses for control of the throne since 1455. When she was three years old, Elizabeth was betrothed to George Neville, the nephew of the influential Earl of Warwick. The betrothal was broken the following year after Warwick defected to the Lancastrian side and rose against King Edward. In October 1470, King Henry VI was restored to the throne and Elizabeth’s father, Edward IV fled to France. Elizabeth, her pregnant mother, and her siblings fled to the sanctuary of Westminster Abbey. Elizabeth’s brother, the future Edward V, was born a month later in the Abbey. The family remained in sanctuary for six months until Elizabeth’s father was able to invade with an armed force, defeat the Lancastrians and re-take the throne. In 1475 Edward IV negotiated a marriage for Elizabeth with Charles Dauphin of France. As future Queen of France Elizabeth was taught French as well as reading and writing. She also learnt how to manage a large household. In 1482 King Louis XI of France repudiated the treaty leaving Elizabeth free to marry elsewhere. Elizabeth’s father was taken ill at Easter 1483 and he died shortly afterwards. Elizabeth’s brother became King Edward V and Richard Duke of Gloucester became regent for the young king. This news was not well received by Elizabeth’s maternal family who did not want to lose influence or power. Eager to carry out his brother’s wishes Richard, Duke of Gloucester had to trick the Woodville family into placing the young king in his care. Richard then installed Edward V in the Tower of London to await his coronation. Elizabeth Woodville took Elizabeth and the rest of her children back into sanctuary at Westminster Abbey. Elizabeth’s mother was persuaded to give up Edward’s brother Richard into Richard of Gloucester’s care. She may have been told that Edward was lonely and wanted the company of his brother or she may have been told that it was the only way to ensure the safety of the rest of her family. Prince Richard of York joined his brother in the Tower of London on 16th June 1483. The two boys were never seen outside the Tower again and became known as the Princes in the Tower. They were almost certainly murdered but the identity of the murderer remains a cause of speculation to this day. In June 1483 it was announced that Elizabeth’s father, Edward, had been contracted to marry Eleanor Butler at the time of his marriage to Elizabeth Woodville. The marriage was therefore invalid and their children were illegitimate. As illegitimate children they were exempt from the succession. Richard Duke of Gloucester was next in line to the throne and on 6th July 1483 Richard made himself King Richard III. in March 1484, Elizabeth’s mother paid homage to Richard and was allowed to rejoin the court. She may have genuinely believed that Richard had no part in her son’s murders or she may have wanted to return to court to try to find support for her cause. She became close to Margaret Beaufort, mother of Henry Tudor and together they agreed that when Henry took the throne he would marry Elizabeth. In 1485 Henry Tudor invaded and marched to meet Richard III. The two sides clashed at Bosworth Field on 22nd August and Richard was defeated and killed on the battlefield. 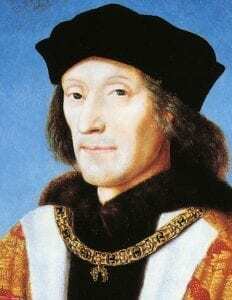 Henry Tudor was proclaimed King Henry VII and, as promised, married Elizabeth on 18th January 1486. At the time of her marriage Elizabeth was described as tall and blonde and very beautiful. The couple’s first child, Prince Arthur, was born on 20th September 1486. The name Arthur was chosen to symbolise a new strong dynasty. Elizabeth and Henry had a total of seven children, Arthur born in 1486, Margaret in 1489, Henry in 1491, Elizabeth in 1492, Mary in 1495, Edmund in 1499, Edward in 1498 and Katherine in 1503. Of these Arthur, Margaret, Henry and Mary survived to adulthood. In 1501 Prince Arthur married Catherine of Aragon in a lavish ceremony at St Paul’s Cathedral. After the wedding celebrations were over the young couple left London to make their home at Ludlow Castle in the Welsh Marches. In the Spring of 1502 they were both taken ill with an infection and on 2nd April Arthur died. Elizabeth and Henry were deeply upset at the death of their eldest son and heir. The hopes of the Tudor dynasty now remained solely with Prince Henry. Although the marriage of Henry VII and Elizabeth of York had ended the Wars of the Roses, there were still those that remained loyal to the Yorkist cause and wanted the Tudors replaced. Early in Henry’s reign a pretender to the throne, Lambert Simnel, claimed to be Elizabeth’s cousin Edward Earl of Warwick. The rebellion was quickly put down largely because the real Earl of Warwick was imprisoned in the Tower. The fact that there was no proof that Elizabeth’s brothers were dead led to the rise of a more serious challenge to the throne by Perkin Warbeck who claimed to be Elizabeth’s younger brother, Richard Duke of York. Many people acknowledged Warbeck as the real Duke of York, but after his capture the pretender confessed to being the son of a Flemish merchant. He was executed for treason. Elizabeth’s feelings on the matter are not recorded but it is likely that she privately wondered if it were her brother. 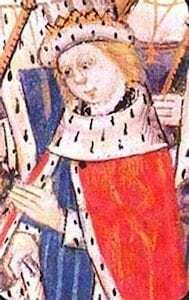 Concern over the succession meant that Henry was keen to father more sons. Elizabeth was 36 years old when she conceived for the seventh time. Her daughter Katherine was born on 2nd February. Childbirth in the Tudor period was risky and the danger of complications or infections great. Elizabeth did not recover from this birth and died on 11th February 1503. She was 37 years old. Princess Katherine died a few days after her mother. Elizabeth was given a lavish funeral and was buried in Westminster Abbey. A bronze effigy was placed on her tomb.